OPM- One pan man. Think of an OPM as an everyday guy. This is a guy that doesn't have a lot of experience, or time to experiment in the kitchen but has a lady he is trying to impress, or just simply wants to beef up his skills, one step at a time. These are simple, quick recipes. This one...requires a lot of chopping. Think of it as good practice. The weather here in IL was less than cooperative for a photo shoot. It was actually sleeting while I took these photos on our porch. Despite the weather, this salad was refreshing and filling. This could be made vegan very easily by making your own vegan feta. In a medium sauce pan bring water and quinoa to a boil. Once boiling, reduce to a simmer, cover, and let cook for about 15 minutes, or until water is absorbed and the round germ is exposed. While the quinoa cooks bring a medium size skillet up to medium heat. Add almonds to the dry skillet and stir occasionally until fragrant and browned. Remove from heat and set aside until ready to serve. To make dressing add ¼ C. parsley leaves, garlic, EVOO, and lemon juice to a small food processor and purée (blend until all ingredients become liquefied). Once puréed place in a small airtight container and refrigerate until ready to use. Once the quinoa is cooked allow to cool in a medium mixing bowl until it reaches room temperature. 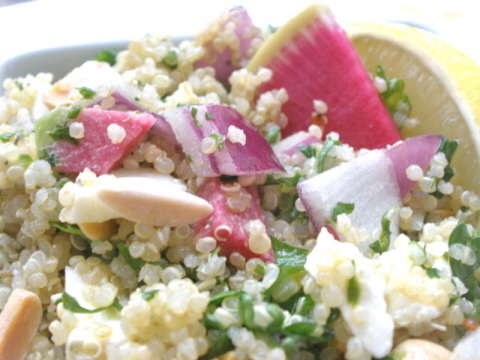 Combine quinoa, ¼ C. parsley, red onion, radish and feta cheese. Place in an airtight container until ready to serve. I recommend chilling at least 1 hour before serving. When time to serve combine dressing, toasted almonds with salad and garnish with a lemon wedge if you choose. This salad would be great with garbanzo beans tossed in there, tomatoes when in season.